I'm not sure about others, but when I try out a recipe, I'll often have leftover ingredients that I don't have the heart to throw away. They get stashed in the depths of my cupboards, thrown in the frozen tundra of the freezer or just pushed into the corner of my fridge. So when I recently made my Cream Triple Berry Pretzel Squares, I was left with quite a bit of crushed up pretzels. What to do... what to do... So I thought about some ways to use it and foods that I liked which had pretzels involved. It began with two office jokesters' pulling a prank on a colleague whose endless tales of his love for Ben & Jerry's made them nuts. They hatched an imaginary batch packed with pretzels, peanut butter, & fudge in vanilla malt ice cream & spread a rumor of a brand new Ben & Jerry's hit called "Chubby Hubby". After searching obsessively he was crushed when the hoax was revealed, so the jokesters home-made a pint. He proclaimed it too good to be a joke & after one taste, so did we. The rest is history. 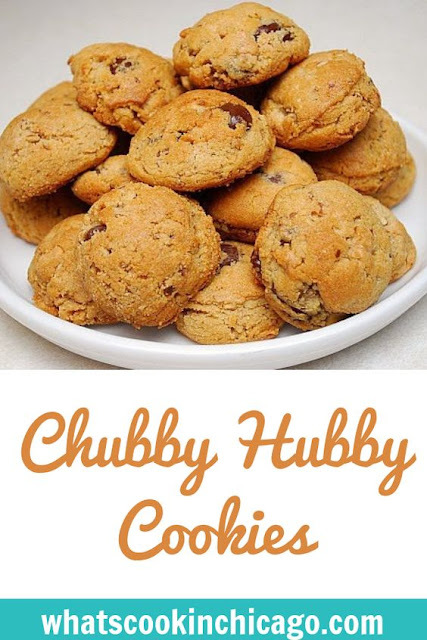 Chubby Hubby -- it's no joke! Inspired by the combination of pretzels, chocolate and peanut butter, I came across a recipe for a chocolate chip cookie made with crushed pretzels. I substituted a portion of the chocolate chips with peanut butter chips and voila... the Chubby Hubby Cookies were soon baking up! I couldn't wait to try one fresh out of the oven and wow. Just wow! I'm not chocolate chip connoisseur but I know a good chocolate chip cookie when I taste one. This has got to be one of my very favorite recipes for chocolate chip cookies because the addition of crushed pretzels just adds the perfect bit of saltiness. Chocolate chip cookie lovers, don't pass on this because you won't be disappointed! * The pretzel sticks can actually be any hard pretzel - thin sticks, standard pretzel shapes, pretzel rods, etc. Place them in a food processor and process until you get the consistency of graham cracker crumbs. If you want more texture in the cookies, pulse the pretzels down to coarse crumbs instead. In the bowl of your stand mixer attached with the paddle attachment, beat butter and sugars until fluffy. Beat in egg and vanilla. Sift flour and baking soda together. Beat into batter on low speed. Stir in chocolate chips, peanut butter chips and crushed pretzels. Drop by rounded tablespoons (or use a small scoop) onto prepared cookie sheets. Bake 11-14 minutes until golden on the bottom and just set in the middle. Cool on wire racks. I've made a similar cookie and I agree the saltiness from the pretzels make them awesome. so, thin pretzel sticks? how "crushed" are these? powdery or still a bit thick? they sound so yummy that I want to get them right the first time! oops, apparently I can't read. I see you already answered my question. LOL!! I will give these a try! thanks! wow good post they sound so yummy that I want to get them right the first time! Wow...these cookies sound great. At the risk of raising my bloodpressure I've always added extra salt to my chocolate chip cookies as I think it greatly enhances the flavor, but doing it with crushed pretzels is a stroke of genius. I can't wait to try the recipe when I'm back home next weekend. What a great idea! I love trying new cookie recipes so I'll have to give this one a try.